Was Japan’s approach the disgrace it’s claimed to be? Why are people disgraced by Japan? Japan and Senegal were level on points, goals scored and goals against going into their final group game, therefore there was a high chance of the group ending with both Japan and Senegal having equal records in the group over the 3 games. Poland scored first out of the two games being played at the same time, but news then filtered through to the Japanese staff and players on the bench that Colombia had also taken the lead. This now meant that Japan were going to the last 16 in place of Senegal due to receiving less yellow cards. For those who missed it, there was quite a lot of outrage at Japan’s approach going into the last 10 minutes of the match. Japan subbed on Makoto Hasebe who is a defensive midfielder for Yoshinori Muto who is a striker. Normally there would be no issue from arise from Japanese manager Akira Nishino doing this, but the problem was Japan were only currently into the last 16 because Senegal were losing. If Senegal scored that would be Japan out of the World Cup again, theoretically they had their destiny in their own hands. On the flipside however, if they sent players charging forward for the win, and Poland counter attacked to get a second, then Japan would have also been out. Make no doubt about it, if that happened the pundits on the BBC would then be calling Japan tactically naïve. 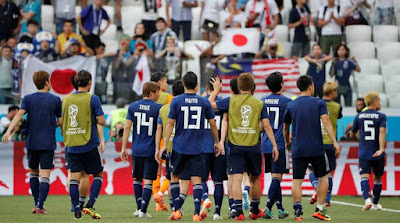 Japanese manager Akira Nishino had to make a choice one way or the other about what Japan should do in the final ten minutes of the game. Should he go for the win, meaning Japan have put themselves into the last 16, or should they see out the game and hold onto only losing 1-0 while at the same time hoping Senegal don’t find an equaliser. As it happens Nishino was brave enough to decide what to do, he decided to play keep ball, see the game out and gamble on Senegal not scoring an equaliser, and that gamble worked out for him – some days it will work, some days it won’t but whatever criticism he gets he can still say he managed to get Japan to the last 16 of the World Cup. Why were Poland not pressing? You can understand Japan wanting to keep the ball, but what the hell were Poland doing? They just let Japan keep the ball in their own half and didn’t attempt to press them at all. Are Poland really that desperate to go home with a World Cup win that they’ve decided to stop pressing a team because the opposition didn’t want to attack? There were more goals there for Poland if they decided to apply pressure onto Japan’s defence who were casually stroking it around the field, Japan had no outlet at all. If Poland won the ball back from the Japanese defence they would have been clean through on goal. Japan will take a lot of criticism for the approach they took, but Poland are in no way blameless either. Nishino has said “it was a very tough decision” in not going for the victory against Poland when they knew a Senegal equaliser would have sent them home. He also wasn’t happy about how Japan performed during the game by stating, “I am really not happy about how we played but…we wanted to go through to the round of 16 and that is the only salvation I can get”. Nishino passed on instructions to Hasebe to instruct the Japanese team to take no risks and get no cards. The Japanese team captain managed to get the message across exceptionally well and Nishino said the players have showed him great respect by performing such instructions just as he asked them to. For some reason the France and Denmark didn’t have the same level of outrage even though their game petered out the same way as Japan vs Poland did. There was a huge number of sideway passes especially in the last ten minutes of that game. The only reason it might not have go the same level of rage from the fans and the media could be because it was not as blatant as in the Japan, Poland match. Mark Lawrenson said on the BBC match commentary close to one billion times that the deciding factor should be goals scored in World Cup qualifying. That is what he claimed should be used as a tie breaker when it comes to this situation again in the future. If FIFA decided to take Lawro up on his idea then it would be even more farcical, Japan play some very weak teams and find it easier to score than say European or South American teams for example. Look at Saudi Arabia as an example of that, they scored 15 goals against East Timor. How would scoring 15 goals against East Timor be a good way of deciding who goes out, or who goes to the last 16 in an event of another tie breaker like this? As well as the level of competition being very different depending on which region of the world you compete in, each region also plays a different number of games. So how would Lawro explain to a team that played 10 qualifying games that they didn’t score as many qualifying goals as Australia who played over 20 qualifying games? Lawro got that incredibly wrong, it’s his view and his opinion which is fair enough, but it isn’t a very good one. The yellow cards works fine as a decider, it’s very unusual for teams to finish their World Cup groups on equal points, equal goals for and equal goals against, therefore this scenario hardly ever occurs. So let us know, are people right to be disgraced by Japan’s last ten minutes of football against Poland? How much are Poland to blame for it? Japan will now face Belgium in the last 16.